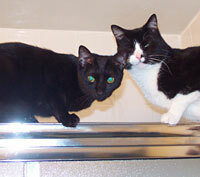 With Niko on the shower rail. Malek is such an amazing cat, where to start. 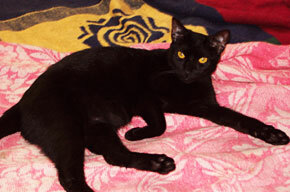 He's extremely affectionate & playful, a combination of sweet & mischievous. He has some funny ways of expressing himself: he follows me into the bathroom & gets upset if he's not allowed in. He jumps up on the sink & leaps onto my arm, like a squirrel on a tree, barely clinging because he doesn't use his claws (thankfully!). He's so happy to be cradled & hugged, but only in the bathroom & office. Elsewhere, he's too cool for that mushy stuff. When I'm in the shower Malek waits, peering into the shower door, meowing with concern. When I'm done, he jumps up on the door rail & paces back & forth mewling anxiously until I dry off & hold him; he purrs contentedly & looks so relieved. Then he leans over & bites my nose. Malek is one of the most playful & active cats at CR!FR. He's paired up with local crime lord Niko & they get into mischief together (but he's not as naughty as the Boss, Niko). He's is such a monkey, he climbs you like a tree if you're standing unaware. 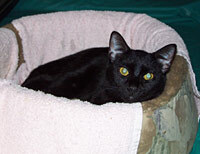 Malek has extra-big eyes & a thin tapered tail that curls over like a monkey's. He has a funny high-pitched, multi-syllable, squeaky meow, something like "MEEaWEEaWEE! ", which sometime trails off into sing-song freestyle. Malek is a real special monkey, I mean cat, at CR!FR.